The answer: Yes! You may think a psychology degree must involve classroom lectures on a traditional college campus, but there are actually many online and nontraditional options for pursuing both undergraduate and graduate degrees in psychology. To get started in an online degree program, you’ll need to consider whether you want to go to a school that is 100% online, or if you are looking for a hybrid program. Hybrid programs are often ideal for a master’s or doctorate psychology degree since they offer more independence and flexibility. Colleges understand the need for open scheduling and dynamic coursework and want to work with you to help you learn and grow in your professional development. Find schools that offer online psychology degrees and apply! There are dozens of schools that have been creating psychology professionals for years through online programs. How do you choose the right one for you? Start by making sure the school offering your online degree program is licensed and accredited by an appropriate body or association. For example, the American Psychological Association (APA) is the largest scientific and professional body in its field, but it only accredits programs at the doctoral level, and then only in the fields of clinical, school, and counseling psychology (as well as some internship and postdoctoral programs). Only programs that require some form of face time on campus are accredited by the APA. Additionally, if you wish to pursue a license to practice psychology, many states require that the doctoral program you attend meet the designating criteria of the joint Association of State and Provincial Psychology Boards (ASPPB )/National Register of Health Service Providers in Psychology (NR). Your best bet is to check with the licensing body in the state(s) in which you intend to practice. Read more about psychology accreditation in our guide, The Importance of Accreditation. 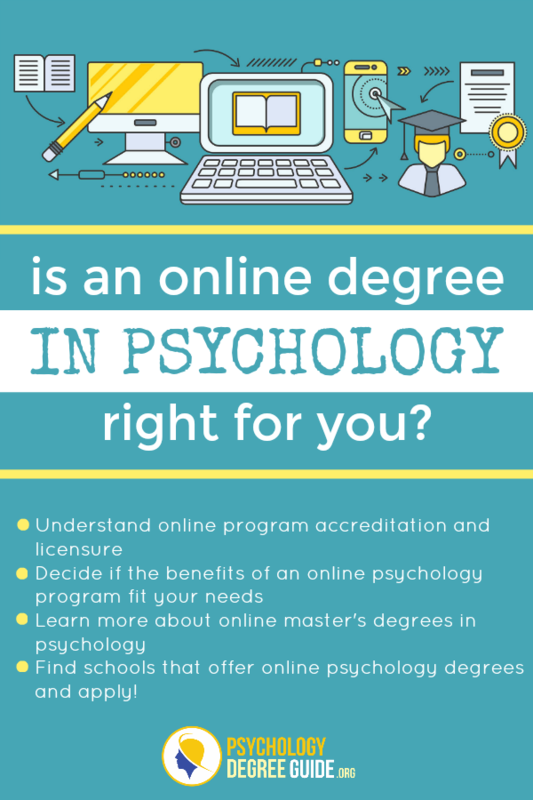 Online psychology degree candidates have many reasons why they should pursue their credentials over the internet instead of in the confines of a traditional classroom. The most common reason cited among those who’ve taken this route is that they were given the opportunity to learn at their own pace. The mandate of getting up early every morning and being on time to a lecture is not a very attractive one to these candidates, but that does not imply laziness. In fact, the online psychology degree program is one for highly motivated individuals, who are able to focus on their studies and would prefer not to be limited by a daily or semi-daily routine. These students can work independently with a high degree of effectiveness. Many finish well ahead of the pace of a traditional on-campus psychology student. In addition to the freedom that an online psychology degree provides, the program is often cheaper, cutting out travel expenses and infrastructure so that a student may learn from the comfort of his own home or favorite coffee shop. Cutting out the commute is also a big deal for those who would otherwise be making a lengthy drive amid soaring gas prices every time they had class. Since the online psychology bachelor’s degree will also travel across state lines and serve as an accepted building block to higher degree plans, it is also preferred because most psychology students who have an interest in their subject and a desire to work in the field understand that employers require a master’s degree at minimum. Beginning with an online degree is a great way to start! The faster a candidate can conquer his undergraduate degree, the faster he can begin work towards his master’s or doctorate, resulting in more prestige and a higher salary. Online psychology master’s and doctoral degree programs give graduate students the opportunity to further their knowledge base and professional marketability, while doing so at their own pace. In fact, the independent study environment is not only preferred among students, but it often works to their advantage as so much of graduate work is about research and building connections within the profession. If you’re ready to further your psychology education with a master’s degree, or even a doctorate, you’ll need to be ready to narrow down your field of interest. Typically, you’ll need to do a research project or thesis, as well as prove your ability to execute database searches, synthesize literature and understand and interpret research methodology. The online BA degree is popular because of how versatile it is in finding a specialty area for higher education. Online programs emphasize theory and case studies over the more scientific areas of the brain, making the degree plan accessible for those who are less focused on the technical areas of psychology. An online BS degree takes the opposite approach, allowing students to pursue a more specialized area of psychology as it relates to the brain and how it functions in human behavior. In both cases, a bachelor’s degree endorses both theory and practice and paves the way for more specialized degree plans for graduate work. Each degree will take approximately four years of full-time enrollment to complete. If you have an associate’s degree you may also be able to apply some or all hours toward the four-year plan. An online MA degree prepares you for the practice of general psychology or sports psychology. As a sports psychologist, you might focus on the psychological benefits of exercise or physical activity. Possible employers may be colleges, universities or pro sports teams. An MA graduate may also choose to enter the teaching profession at the secondary or collegiate levels. The online MS degree program focuses primarily on counseling and school or social psychology. Guidance counselors often choose this career path with the goal of helping students reach their academic, career and social development goals. The MS graduate also prefers the clinical psychology setting, helping others to overcome behavioral, emotional or mental disorders, to strengthen relationships and improve the subject’s function within society. While the online PhD is linked to philosophy, it is not an actual degree in philosophy, but rather the highest honor for most professional fields of study. It symbolizes your pursuit of knowledge to the top of your field and psychology is no exception. Some states offer an alternative, the Doctor of Psychology (PsyD), but most employers see the two as interchangeable when considering the doctorate holder for a position. For those who attain an EdD, the goal is to work more closely with the educational profession. These graduates can often be found in primary and secondary schools as well as within colleges and universities. At the collegiate level, an EdD graduate makes a perfect candidate for a faculty position. Whichever path you choose, the online doctorate in psychology degree will require intensive research and a commitment to the field of study. Supervised clinical experience is also expected. The amount required will depend on the state and the educational institution. But for those with strength and talent for the subject area and a yearning to help others, it is a degree plan well worth the effort.